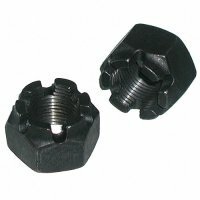 Hex castle nuts have a grooved head allowing a cotter pin through the nut and into a hole in a bolt shank. Thus preventing the nut from slipping off the attached bolt. Often used in machinery, shafts and automotive applications. Although very similar, a castle nut has slight variations from a slotted nut. A castle nut has cylindrical slots equal in length to the slot depth. The diameter is smaller than the hex width. Fine thread hex castle nuts, grade 5, with a black plain finish.